dreams of genevieve: why not make a day of it? Kate was right - any trepidation I had about my first massage disappeared in about five seconds. Rita was my "medical aesthetician." She led me to a dimly-lit room, the sound of ocean waves in the background. She was the kindest lady, and she's been giving massages and studying aromatherapy for 16 years. To get to know me, she asked, "Do you have kids?" I said, "No, not yet." She then said, "By God's grace, you will have children." I replied, "I do believe that." She then asked if I was a Christian (yes), I asked her the same ("Oh, yes!") and I knew that in every way, I was in for a treat. Rita's goal was to give a good enough massage that I would fall asleep, but I was too curious. We talked about God's timing in life, and of course, I had to know which essential oils Rita used. 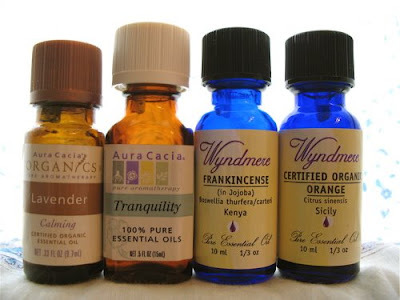 She prefers lavender for relaxation, and an oil blend containing eucalyptus for muscle tension. She asked, "Are those OK?" If she only knew what an aromatherapy geek I am (see the above photo). Just the night before, I was reading a Young Living magazine, very interested in their Aroma Seiz blend (basil, lavender, cypress, marjoram, and peppermint) which one customer rubs on her jawline each night to reduce clenching. Aroma Seiz also provides comfort for the head, neck, tired feet, and charley horses. Rita did not make me fall asleep, but I came close. She worked out tension in my neck, shoulders, back, arms, hands, legs, feet, head, face, and jaw. At one point, she even placed lavender oil in her palms and held her hands right over my nose. HEAVEN. My entire body relaxed. A few times, the massage hurt a little bit, but afterwards I was thankful for the minor pain - the locations of very tight muscles. My Dad (a coach) does always say, "No pain, no gain." But mostly I kept thinking, "Why in God's name have I never had a massage before?" My mother-in-law will receive a prompt, passionate thank you note. I walked out of D'Elegance spa a new woman, and suddenly very sleepy. I pined for my bed. Next time - yes, there will be a next time - I'll make an appointment in the evening, closer to bedtime. And maybe just a half hour - for the budget. In fact, I enjoyed the whole aromatherapy trip so much that we'll start giving gift cards on special occasions. I am pretty reserved; if I can enjoy a massage, anyone can. The massage was luxurious, so Johnny and I decided to make a day of it. A "date day." We caught a matinee of Iron Man which was so much fun. Johnny snacked on "movie food," I munched on walnuts, and we loved the movie. Before I met Johnny, I probably would never have gone to see a comic book adaptation, but I'm glad my husband introduced me to such films. They're pure fun, often very good stories, and my favorite part is peeking at Johnny's facial expressions during the movie. It gives me a glimpse of Johnny as a little boy - extremely cute. Robert Downey Jr. was fantastic (he always is), I'm a Gwenyth Paltrow fan, and the film had a great message. I do recommend Iron Man on the big screen. After the massage & movie, I was starving. We've been wanting to try a local restaurant for quite some time - Cedar's Mediterranean Grill & Market - so we hopped on over. I had trouble focusing on the mouthwatering menu due to the eclectic market items, including baklava. I am totally eating baklava when I'm healthier. I ordered the chicken shawarma plate; J. ordered the kafka kabob plate. Both of our entrées came with a bowl of lentil soup, salad, hummus, pita bread, and rice. No bread or rice for me, but after a few polite questions to the owner, we discovered that Cedar's is very yeast-friendly. They don't cook with butter, no vinegar on the salad, etc.. And let me just say, that was the best hummus I've ever put in my mouth. We'll be dropping by for to-go orders of hummus. Maybe weekly. The whole feast was amazing! I kept smiling and eating. We even ordered an ibrik full of Turkish coffee to share. I inhaled the aroma of cardamom. But I took one sip and had the urge to spit it out. Don't get me wrong - it tasted delicious - but my long-deprived tongue tasted sugar. I swallowed that sip, but I was bummed out. Turkish coffee is traditionally prepared with sugar, so I should have known, yet in my defense, other Houston restaurants serve it without sugar, too. Bosnian coffee is great. It wasn't as strong as the Turkish coffee I tried to drink at Cedar's (I like my coffee strong), but Bosnians make good coffee, too. I should mention here that at the back of Café Europe, a group of teenagers sat around a large, low table smoking a hookah. I guess I really am 33 because I asked Johnny, "How old are they? They can't be 18." We discussed how we'd feel if our own kids smoked a hookah one day. We have friends who smoke and my brother smokes. Our Church holds a men's pipe (and booze) club once a month. I don't think smoking is an evil habit, but Johnny and I decided we are personally not fans of smoking. I do love the smell of pipe tobacco, and cigars & pipes are different since you don't inhale. But my father-in-law tried to quit smoking cigarettes at the end of his life, and he died of emphysema - I believe our children need to know that. I suppose we all have a habit or two that may not be great, but not sinful, either. It was just eye-opening to see a group of such young people smoking together, though I was mesmerized by the hookah. I'm intrigued by other cultures, you know. OK, off my soapbox now. To round out the day, we did some Target-shopping. Truly, we've been needing some basic necessities like new (organic) sheets & (Thomas O'Brien) towels, special-sized light bulbs, new measuring spoons; and I needed new hairbrushes, hair clips, and sunglasses. I don't know what it is about Target, but I like walking around that big box w/Johnny. I do not feel the same way about Wal*Mart or Kmart. Only Target. So that was our fun date - fun to us, at least. I'm sadly exhausted today, though. However, to see another view (other than our walls at home) was a relief. 'Twas a blast to get a massage, watch a movie, and discover the exotic in Katy, TX. 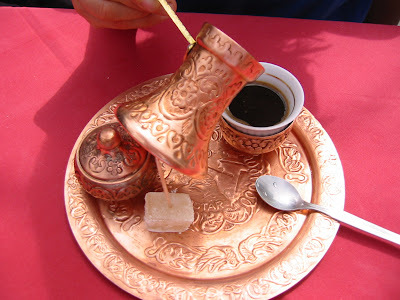 We own a large ibrik for our personal Turkish coffee needs, but now I'm Googling, "where to buy a Bosnian coffee set?" Hope you have restful sleep tonight! The massage sounds heavenly - truly! I felt the same way as you but after I had my first spa treatment I vowed to keep taking care of myself in that way. I hope you do too! And your day with Johnny sounds so wonderful. Especially the hummus & coffee! what a lovely day! and i agree with megan, i'd like another massage - now. i didn't want to fall asleep either. i would have felt like i was missing something. but that state where you are just on the edge of sleep - that's wonderful. jenni, so glad you had a beautiful and memorable day. i am a SUCKER for massages, and if i could afford it, i would have one weekly. without a doubt. i pinky swear...the child barely watches TV!!!!!!!! It sounds like a wonderful day! You deserved some pampering. Please let me know where that restaurant is, it sounds yummy! Also, I just HAD to laugh at Lauren's comment about her daughter singing Target's commercial song. Violet and I do the same exact thing! :~) Is it a girl thing or are we just a little crazy? Just kidding. Thanks, y'all! I'm saving my pennies for a half-hour massage SOON. Hi, Brite! I love Kate's blog ~ she's a cool lady. Thanks for reading here.